Want to make your own cleaning products? 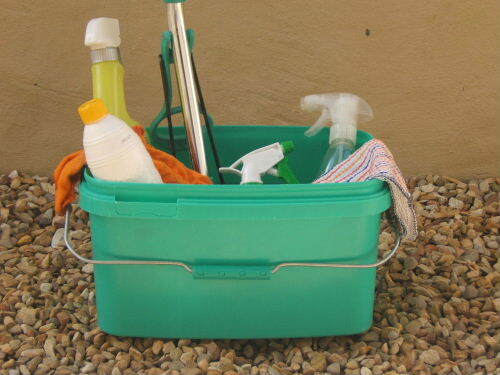 Spring-cleaning my house often left me with a huge headache and a horrible chemical smell in my nose....ugh! Plus it left quite a dent in my pocket! A dent I can seriously do without - you know me - always looking for ways to cut costs! Mix it all together and pour it into a clean spray bottle. You can use it to clean all surfaces, including tile floors. Pour 2 Tablespoons of Bicarbonate of soda and 1/2 a cup of white vinegar into the drain. Cover the drain with a cup (or similar sized bowl) while the mixture is fizzing. Wait until the fizzing starts to die down and pour a large amount of freshly boiled water into the drain. The solution will break down fatty and soapy build-up in your drain. I also use this solution in my toilet but when it starts fizzing, I scrub the toilet briskly. Spray those stubborn stains with undiluted vinegar and give them a good scrubbing. Instead of using your usual fabric softener, add one tablespoon of vinegar to your load of washing. And wash your clothes as normal. Your clothes won't have a vinegar smell and will be nice and soft. Make your own bathroom freshener. Air fresheners are not only expensive but also not good for the environment. Place the charcoal and activated charcoal in one of the containers with a few vanilla pods. Fill the other container with scented oils like Jasmine, Lavendar or Rose oil. The charcoal will eliminate the bad odours, while the scented oil will leave your bathroom smelling beautiful. The steam mop or steam broom is an altered version of the mop that is used to clean floors including hardwood floors, tile, carpet, kitchen floors and more. The mop comes equipped with a tank or water reservoir which becomes heated to produce steam. By using steam you can save money on detergent as all you need is water! To learn more about this way of cleaning and to get unbiased and accurate reviews of steam cleaners, steam mops, saunas, steam showers and other steam products, visit steam cleaner reviews. Quick, easy and affordable, aren't they? I haven't completely done away with all of my usual cleaning products but I use the above cleaning solutions most of the time, which has definitely helped keep my costs down to a minimum. To remove those wet glass ring stains on wood surfaces. Mix vinegar and olive oil together in equal amounts. Rub the stain with the grain (in the direction the wood's fibers are flowing) and polish the wood as normal. If you have any ideas on how I can be of any more help to you and if you need specific frugal cleaning tips or advice, then please contact me.